The New Dial Miracle Oil Hand Soap is infused with Marula Oil and uses Micro Oil technology to nourish and deeply hydrate your skin. It gently removes dirt from your hands and leaves them feeling soft, smooth and refreshed while protecting your skin from skin damaging free radicals. I loved the Miracle Oil body wash and I love the hand soap. 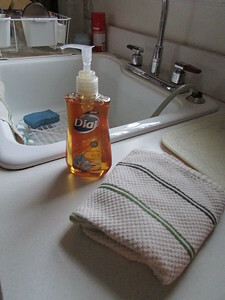 Some products that have oil in them leave a sticky residue but not the Dial Miracle Hand Soap. This deep cleansing hand soap has a fresh scent that is not overpowering and rinses clean with no sticky residue. My whole family loves it!! So would you like to try this great conditioning soap? Enter my contest! Open to USA only! One winner.